Light in the form of a plane wave in space is said to be linearly polarized. Light is a transverse electromagnetic wave, but natural light is generally unpolarized, all planes of propagation being equally probable. If light is composed of two plane waves of equal amplitude by differing in phase by 90°, then the light is said to be circularly polarized. 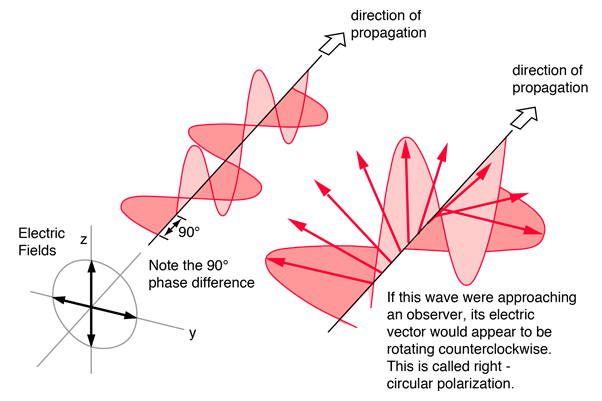 If two plane waves of differing amplitude are related in phase by 90°, or if the relative phase is other than 90° then the light is said to be elliptically polarized. A plane electromagnetic wave is said to be linearly polarized. 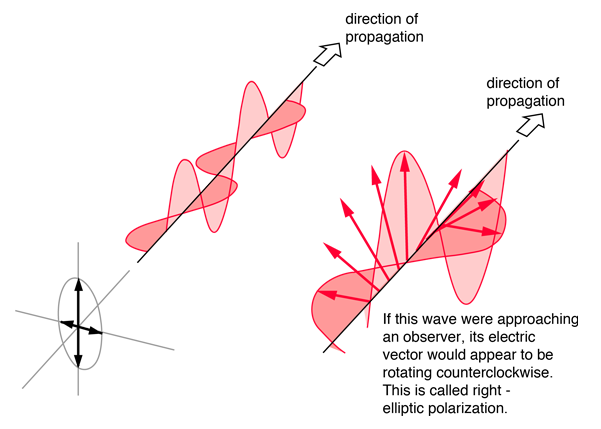 The transverse electric field wave is accompanied by a magnetic field wave as illustrated. 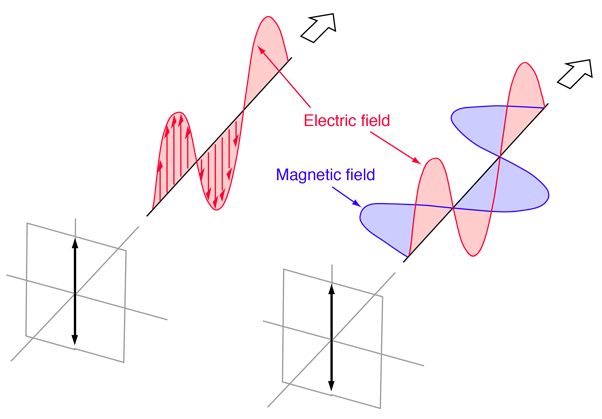 Circularly polarized light consists of two perpendicular electromagnetic plane waves of equal amplitude and 90° difference in phase. The light illustrated is right- circularly polarized. If light is composed of two plane waves of equal amplitude but differing in phase by 90°, then the light is said to be circularly polarized. If you could see the tip of the electric field vector, it would appear to be moving in a circle as it approached you. If while looking at the source, the electric vector of the light coming toward you appears to be rotating counterclockwise, the light is said to be right-circularly polarized. If clockwise, then left-circularly polarized light. The electric field vector makes one complete revolution as the light advances one wavelength toward you. Another way of saying it is that if the thumb of your right hand were pointing in the direction of propagation of the light, the electric vector would be rotating in the direction of your fingers. Circularly polarized light may be produced by passing linearly polarized light through a quarter-wave plate at an angle of 45° to the optic axis of the plate. Elliptically polarized light consists of two perpendicular waves of unequal amplitude which differ in phase by 90°. The illustration shows right- elliptically polarized light. If the thumb of your right hand were pointing in the direction of propagation of the light, the electric vector would be rotating in the direction of your fingers.